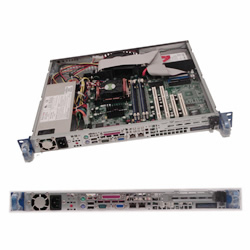 Acme FA1426-AT3 back-to-back 0.5U Front Access server. ** all connectors (included power cord, add-on card) are accessible from front panel. ** for best cooling result - airflow is from rear to front direction. 260W output, UL FCC approved, high-efficiency. One Intel Atom D510 processor included. 1.66GHz, 1MB L2 cache, dual core, 4 threads. 2 x SO-DIMM, DDR2 667 MHz, un-buffered memory. Intel® ICH9R SATA2 (3 Gbps) controller (6-port). 2x Intel 82574L Gigabit Ethernet. ** memory, HDD are option, not included.